Hey you. Yes, you, the helpful person in line behind me at the grocery store. 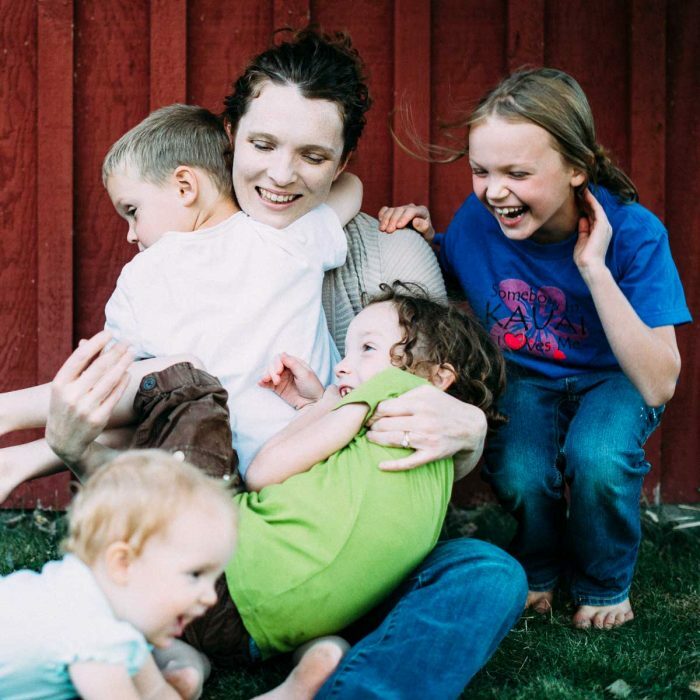 I know it looks like I’m struggling through a complicated dance as I tie my baby on my back. But I know what I’m doing. I’ve done this before. Hundreds of times. And the last thing I need right now is for you to try to “help” me without asking. 1. I have it down to a routine. Please don’t interrupt. 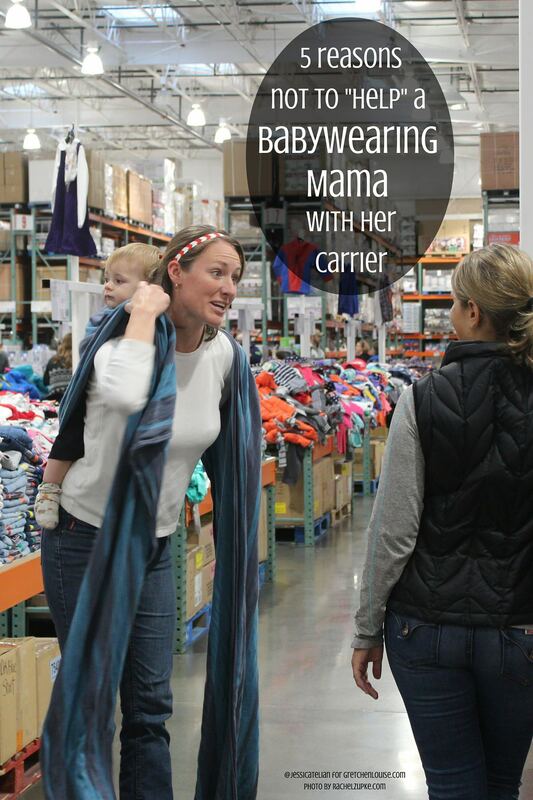 Most babywearers have a specific, oft-practiced routine for getting their little one safely into a carrier. 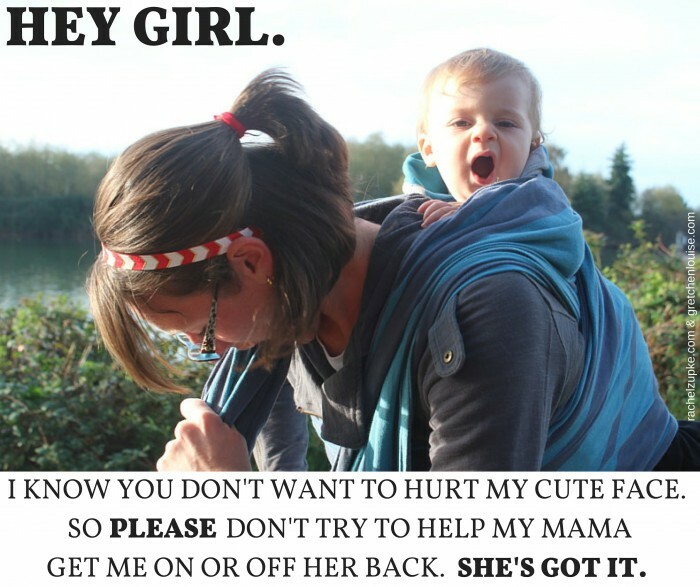 This is especially true for those of us who often do back carries. 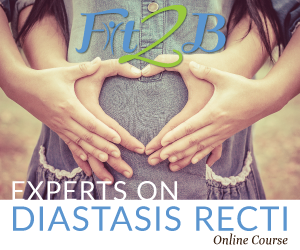 Any type of interruption of that, such as grabbing part of the carrier to “help”, can disrupt my routine and make it incredibly difficult to finish and get my baby on my back safely. 2. You might get hit. Placing a baby safely on your back and fastening a carrier securely around them requires some arm acrobatics. It may look like I’m just flailing my arms around, but I know what I’m doing. Except that you’re standing in the exact spot I need to put my arms. Even though I’m a bit upset at you right now for endangering my baby by trying to “help”, I don’t want to accidentally hit you. So please, move away. Thank you. 3. My babies know the routine. My babies are used to how I get them on my back. Yes, I’m ready to catch them if they decide to suddenly throw themselves around (and I have successfully caught them the few times that happened), but in general, they know the routine, too. They usually lie still and wait until I say I’m ready for them to move around again. You entering our space makes it more likely that they’ll do something unpredictable. Please, let us continue our routine in peace. 4. You may think you know what my next move is, but you don’t. You don’t know what kind of carry I’m planning. You don’t know my baby’s preferences. 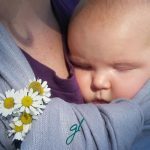 And even if you’ve worn a baby in a carrier before, each person has their own unique way of putting their baby on safely. Don’t think that you can anticipate my next move, especially if you’ve never seen me do this before. 5. Please assume that I don’t need your help. Unless I ask for it. If you really feel like I might need help, I am totally fine with you asking if I need it. But please don’t grab without asking. Doing so will endanger my baby. And you do not want to see how I react when someone endangers my baby. 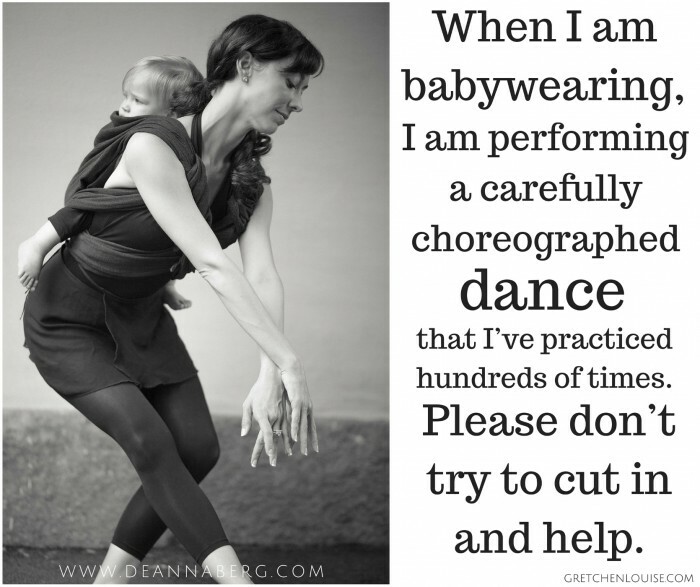 When I am putting my baby in my wrap or carrier, it’s like I’m performing a carefully choreographed dance that I’ve practiced hundreds of times. I know you wouldn’t run out on stage and try to “help” me and my dance partner during a performance, especially if one of us was suspended off the ground in some manner. I know you understand how that could risk the safety of all of us. 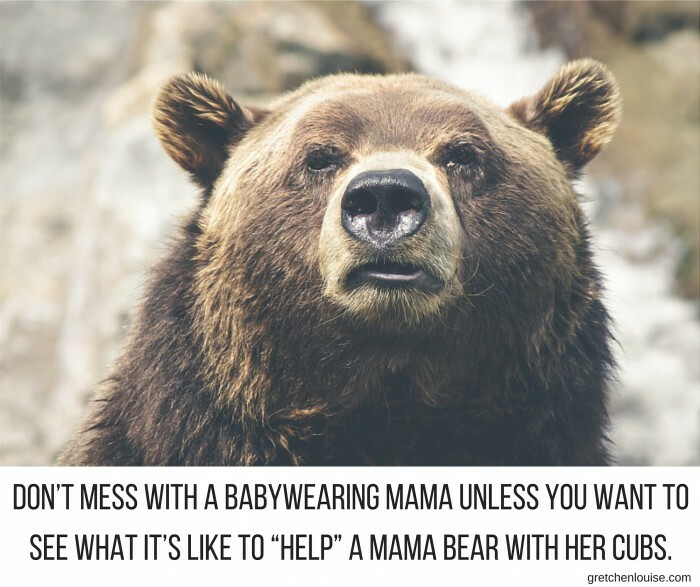 So please don’t interfere with my babywearing dance, either. I had this situation just the other day. 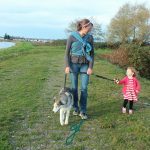 Trying to get my boy into a wrap because my toddler decided that she needed to be in the pushchair. Stupid person asking if they could “help”….l erm how about entertaining the tantruming two year old in the pushchair while I do this thing?! 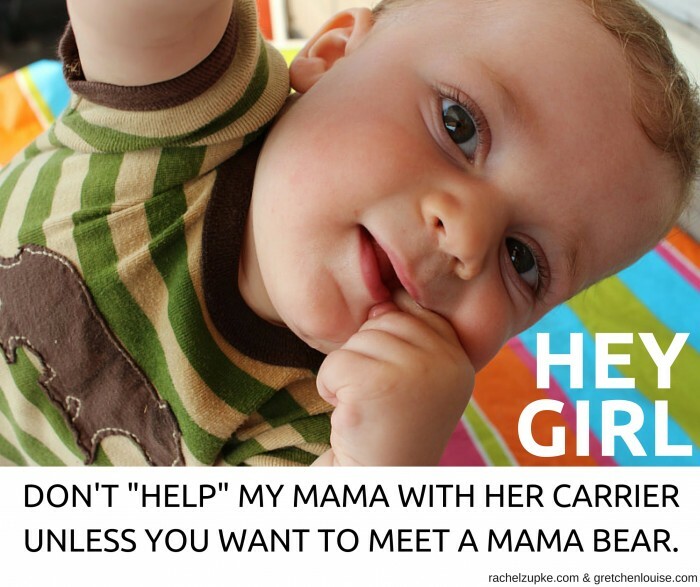 Yes, babywearing mamas welcome conversation! 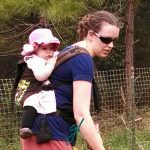 I have nooooo problem talking with anyone about the joys of babywearing. 🙂 I wish I could talk to everyone about it, though, because then this post wouldn’t need to be written because it would be understood that it’s actually safer to let us do it unless we ask. Guess this will help at least get the conversations started! I think it’s a good reminder that, no matter the circumstance, we shouldn’t be quick to insert ourselves into someone else’s routine without the simple courtesy of asking if we can be a help to them. I’m thankful to have read this post. I’m one of those people who wouldn’t hesitate to jump in and help someone if I felt like they were struggling. This should help remind me to at least ask if they want help. And that dancing picture is sooo elegant. 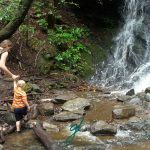 I know that this post made me realize that I should pause and think other situations, too–not just those related to babywearing. How often have I assumed my help was wanted and instead made things worse! What a complainer. All this article was about was you complaining about what seems like very nice people trying to give you a hand and you seem too self righteous to accept help. 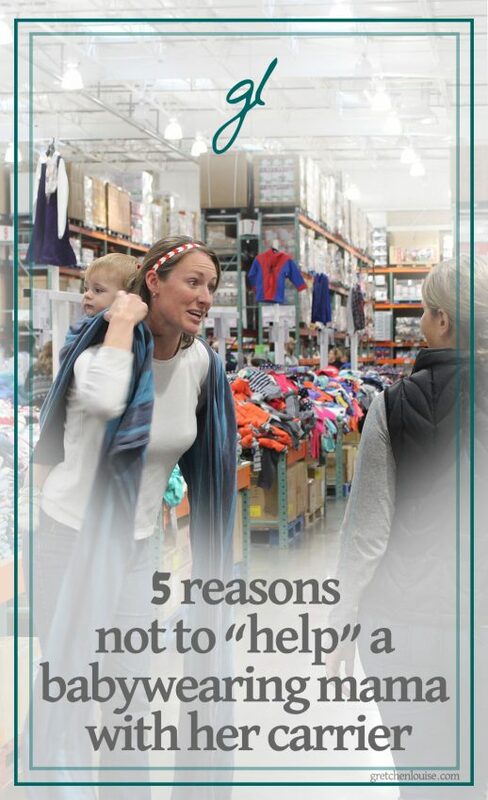 Would you rather they not offer a hand and your baby decided to fling themsleves backwards and bust their head on the flood of the grocery store?! Geez just be polite and say no thank you and stop your complaining! She was talking to people who just jump in and grab the carrier, wrap or baby. She clearly states, if you had any reading comprehension AT ALL, that she didn’t mind people asking if she needed help. As evidenced by the quote below. “If you really feel like I might need help, I am totally fine with you asking if I need it. But please don’t grab without asking. Doing so will endanger my baby. And you do not want to see how I react when someone endangers my baby.” Ypu CLEARLY only read the numbered bullets. Amen and Amen!!! Drives me CRAZY!!! I usually wear a Mei Tai and when someone grabs the straps and hands them to me I usually have to start completely over! Arg! I understand the point of view of the writer. I do. But I think of the hundreds of scenarios where one person sees another person who appears to be in need, they help and the one they helped is grateful. Imagine that. Grateful that a perfect stranger took time out of their lives to help someone who (they perceived) was in need. I understand what the writer is saying and the potential risk to the baby if someone interferes at the wrong moment. But I will always be grateful to someone who tries to help, as long at the intention is good. Great perspective! I think that the author overstated on purpose in order to make a point about the safety concerns. I appreciated the reminder in general that I should take the time to ask before jumping in to help someone who may not have wanted my interference. I <3 this so much. I also wish people would stop looking at us funny while we are putting our baby on. We don't look at the moms who struggle to carry a heavy baby in their arms funny, why can't we not get funny looks, too. But, in reality, I'll take the funny looks and save my back, so….